It�s a journey, which will be etched in their memories forever. As many as 128 passengers and crew of Air India�s Abu Dhabi-Delhi flight, which had to make an emergency landing in Pakistan after a technical snag, are back home safe. They were flown back in a special relief plane which took from Nawabshah airport in Pakistan and landed at the Indira Gandhi International Airport here at 5 pm. 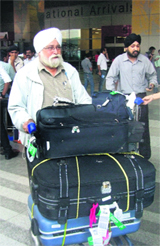 The Punjab Government has chargesheeted former Patiala Deputy Commissioner Vikas Garg for dereliction of duty. The chargesheet has been approved by Chief Minister Parkash Singh Badal, following which a vigilance probe has been ordered into the sale of government land at Patiala. Parole, it seems, is being used as an escape route by jailbirds in Punjab. Sample this: From January 1, 2005 to July 6, 2011, over 300 prisoners, who were out on parole, did not return to their respective jails even after their parole term expired. While the police managed to re-arrest over 100 fugitives, the remaining 200 are absconding. The Army has not decided to reduce the troop strength from the J&K. Top commanders are of the opinion that any lowering of guard could be a setback to the hard earned peace. The Army�s response comes at a time when there is a heated debate on withdrawal of the Armed Forces Special Powers Act from parts of the state. UPA presidential nominee Pranab Mukherjee was in Kolkata today to seek support for his candidature in the July 19 election but his much-awaited meeting with key Congress ally Trinamool Congress chief and West Bengal Chief Minister Mamata Banerjee failed to materialise, raising serious questions about the durability of her relationship with the UPA government at the Centre. The devastating flood in Assam, besides taking at least 124 lives, has left a trail of destruction especially in the agriculture sector, the backbone of state�s economy. 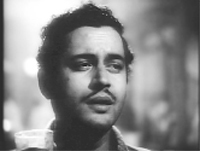 In the city where Vasanth Kumar Padukone, better known as Guru Dutt, was born on this day 89 years ago, no event has been held to celebrate the occasion even though the city boasts of a robust film culture. But not everyone in the city has forgotten him.